Eva Emery Dye (1855 – February 25, 1947) was an American writer, historian, and prominent member of the Women's Suffrage movement. As the author of several historical novels, fictional yet thoroughly researched, she is credited with "romanticizing the historic West, turning it into a poetic epic of expanding civilization." Her best known work, The Conquest: The True Story of Lewis & Clark (1902), is notable for being the first to present Sacagawea as a historically significant character in her own right. Born Eva Lucinda Emery, the daughter of Cyrus and Caroline Trafton Emery, in Prophetstown, Illinois, she first attracted notice at the age of fifteen, when she began writing poems under the pseudonym "Jennie Juniper". These works, published first in the local Prophetstown Spike then in other regional newspapers, fueled an ambition for intellectual achievement that was unsupported by her family. When her father opposed her seeking a college education, she worked as a school teacher and saved the funds to attend Oberlin College independently. "At the turn of the [20th] century Eva Emery Dye replaced [Frances Fuller] Victor as Oregon's best-known historical researcher," wrote Richard Etulain in 2001. "But Dye turned her prodigious findings toward other ends, producing several works of historical fiction." Writing in a style later described as "a curious blend of fact, fiction, biography, and romance," Dye first completed McLoughlin and Old Oregon (1900), a portrait of Doctor John McLoughlin 1784-1857, the former Chief Factor of the Columbia District and for years the de facto leader of the Oregon Country. While taking considerable liberties with its subject (including imagined scenes and invented dialogue), the work was nevertheless based upon considerable research, including extensive interviews with aged pioneers who had known McLoughlin personally. The book's popular success established Dye as an author, and contributed to the posthumous re-evaluation of McLoughlin's complex role in American history. Dye and her husband also interceded when McLoughlin's house in Oregon City was slated for destruction, leading the effort to purchase it and restore it as a museum in 1910. It is now part of the Fort Vancouver National Historic Site. Dye then began researching the Lewis and Clark Expedition, which had reached the Pacific Northwest in 1805. Her subsequent book The Conquest was loosely a joint biography of William Clark and his brother George Rogers Clark (who did not accompany the expedition), yet it was soon lauded for its vivid portrayal of a personage who had played only a minor role in earlier narratives. The Expedition journals make note of her service as an interpreter and mention that she pointed out familiar landmarks when they entered Shoshone territory. There is little evidence to suggest, however, that she acted as the Expedition’s guide beyond recognizing Bozeman Pass as a good place to cross the Continental Divide. Sacajawea's hair was neatly braided, her nose was fine and straight, and her skin pure copper like a statue in some Florentine gallery. Madonna of her race, she had led the way to a new time. To the hands of this girl, not yet eighteen, had been entrusted the key that unlocked the road to Asia...Some day, upon the Bozeman Pass, Sacajawea's statue will stand beside that of Clark. Some day where the rivers part, her laurels will view with those of Lewis. Across North America a Shoshone Indian princess touched hands with Jefferson, opening her country. The world snatched at my heroine, Sacajawea...The beauty of that faithful Indian woman with her baby on her back, leading those stalwart mountaineers and explorers through the strange land appealed to the world. The book's popularity also brought political ramifications. As Dye noted in her book, Sacagawea had been given a vote in a key decision of the expedition: whether or not to build Fort Clatsop and spend the winter on the Pacific coast. This led to "the Madonna of her race" being championed as a symbol of the burgeoning women's suffrage movement, which Dye enthusiastically supported. 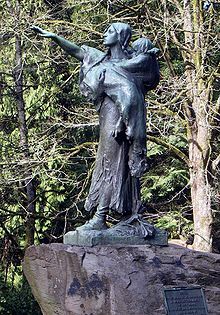 In keeping with her book's suggestion of a memorial to Sacagawea, a Statue Association was founded in Portland, Oregon, with Dye serving as its president. In this capacity she issued appeals to women's groups across the country, and coordinated the fundraising sale of commemorative "Sacajawea spoons" and "Sacajawea buttons." Following the ceremony, Dye formally presented the statue to the soon-to-open Lewis and Clark Centennial Exposition, where it was seen by an estimated three million visitors. It currently resides in Portland's Washington Park at 45°31′17″N 122°42′08″W﻿ / ﻿45.521469°N 122.70227°W﻿ / 45.521469; -122.70227﻿ (Sacajawea statue in Washington Park). "Historical Sketch of Oregon City", chapter in Portland, Oregon: Its History and Builders by Joseph Gaston, 1911. ^ Katrine Barber, Portland State University, writing in the Oregon Historical Society Quarterly, Vol. 106, No. 3 (Fall 2005). ^ Etulain, Richard (September 4, 2011). "A brief history of Oregon historians". The Oregonian. ^ Quoted in Sacagawea of the Lewis and Clark Expedition, by Ella E. Clark and Margot Edmunds (University of California Press), page 92. ^ Quoted in Sacagawea of the Lewis and Clark Expedition, by Ella E. Clark and Margot Edmunds (University of California Press), page 94. ^ Quoted in Sacagawea of the Lewis and Clark Expedition, by Ella E. Clark and Margot Edmunds (University of California Press), page 95. "Eva Emery Dye". The Oregon Encyclopedia. This page was last edited on 1 February 2019, at 07:11 (UTC).